We are currently slowly recovering from a a recession. Companies therefore strive to find the most efficient and cost-effective way of getting their messages on the big stage. The impact of traditional marketing efforts are getting increasingly smaller due to the rising popularity of new technologies and the ever changing purchasing habits of consumers and companies alike. Online video is growing very rapidly as a result of this. Online video is an increasingly popular form of communication and is being made part of the media mix by more and more marketers around the world. The use of video will only increase. Companies are making use of video, more and more, for the purpose of marketing and communication. You might wonder if you too should trust in this form of marketing. And it will only keep on growing. Internet usage and bandwidths will increase significantly in the coming years. Cisco predicts that in 2015, people will watch a total of one million minutes – that is 674 days – of online video every second. This is four times as much as in 2010. Online video is getting an increasingly larger market share in the daily media usage of not only the consumers, but also in the business end of things. Video is an easy medium for the receiver, way better than just a slab of text. Why is this the case; because pictures say more than words. People are visually oriented. Besides, let’s be honest: it’s more convenient. You can interpret written words in a lot of different ways; the verbal element is missing. A video, on the other hand, acts on multiple senses, you will get a better feeling accompanying the story; you might even get to imagine it. A video shows you who you are and what you mean. Video is also a very good tool to visualize things. Your message will be more clear and will thus stick better with your audience. It’s also just more fun to watch a video rather than reading a boring looking text, a lot of people think so anyway. A video is more personal than a block of text. You can show just that bit more of your company. You can give your company a face or you could offer a “look inside your kitchen”. This, of course, depends on the way you use video. The important thing is that professional and clear videos can contribute to the positioning and credibility of the company. A video can give trust; just that little amount of trust that your (potential) client needs. For instance, what’s better than a client on video telling other (potential) clients about your services or products? Video testimonials are the best evidence and most convincing marketing that you can get. 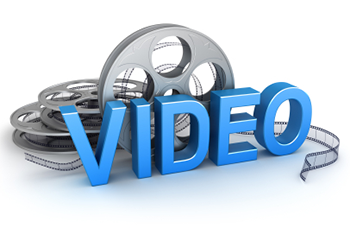 Using video on your website will get you a higher Google ranking which improves your findability. Supplying your video with titles, descriptions and labels with your most important keywords will improve your indexing on these search engines. An improved index helps you get a higher position on, for example, Google and YouTube. YouTube is the largest video search engine and part of the Google search engine. Video search results are thus displayed in between the regular search results, often on top of the first page. Hence placing your video on YouTube will absolutely get you new visitors. The best way to do this is by embedding the YouTube player on your website. In the digital (social) age we live in, it is easier than ever to share media. This includes your videos. By mixing video and social media, you gain the potential to reach a very large audience. This is, of course, dependent on the amount of followers or fans that you have, and the quality of these. By sharing your video on social media channels, you not only enlarge the reach of this video among the people that already follow you, but it also provides you the opportunity to share content with friends of your friends. The more channels your video is available on, the larger your target audience becomes. It’s also important to keep in mind the reasons why videos are being shared. Your video has to be “enjoyable” enough and has to address the people that view it. The video also has to be worthwhile to (finish) watch(ing), so you should always be certain that your video is interesting enough for your target audience and that your video looks good. A video is a good investment. For a relatively small amount of money, you can realize a very nice video that is produced to your exact specifications. The costs of this is much lower than say, a television commercial. Spreading your video on the internet also incurs no costs, as opposed to those precious seconds on the television. And certainly not less important, you will also have a platform to interact with your target audience. Give your viewers the means to respond to your video, for example on YouTube, or even on your website in the form of a blog. An important factor regarding the justification of the investment: the average click through rate for online commercials is 4 to 9 percent. That is 25 to 75 percent higher than the click through rate of banner ads and other online advertisements! Rebekka’s skills are not limited to video editing only, she is also a great copy writer who understands that marketing is about highlighting the benefits of the feature.